Christophe Lemaire - Can't You Hear Me? Essential garage Zamrock/soul/funk: the first official reissue of the celebrated band’s one and only album. The musical style that became known as Zamrock came to embody the economic despair that followed the 1973-1974 oil crisis, which flung Zambia into recession and exacerbated a wide range of social tensions. Much of Zamrock also captured the controversy of wider politics in Africa and the world. 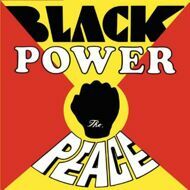 Perhaps the finest example of this is Black Power by The Peace. - The Guardian. The Boyfriends, from Kitwe’s Chamboli Mine Township, supplied the founding members for Zamrock’s most famous band, Witch, and kick started one of Zamrock’s best bands, Peace. Their sole Zamrock entry, Black Power, recorded at Malachite Film Studio circa 1973/4 and issued circa 1975, sounds like nothing else in the Zamrock canon: a lost message drifiting from the flower power era, imbued with a fiery Zambian voice.